If you follow me on Instagram, you’ve seen me post a picture of this set. I got this from my sister and her boyfriend for Christmas and I was really happy to have so much to try out! This set gives a great assortment of products: four eyeshadow palettes, a sample-sized convertible color for lips and cheeks, an eyeshadow brush, an eyeliner, and a sample-sized liquid lipstick. The only mirror in this kit is in the convertible color, which is a little bit of a let down, but everything pops out, making the items travel-friendly. The kit comes with a small card that gives step-by-step instructions for a look you can do with each palette. I’ve said before that I’ve always been a little uncomfortable with cream blushes, but I’ve been looking forward to trying one of these because you can use it on the lips too. It’s pretty easy to blend this out on the cheeks, although I certainly need some practice getting it right. It’s a nice color on the lips, a little bit lighter than my natural lip color and much more pink. It goes on very opaque, which is awesome for a light color for me. This brush is really big and fluffy, so it works perfectly as a blending brush. It doesn’t seem like the best quality brush ever, though. I think I’ll use this to set my undereye concealer when my Sigma E40 is dirty. I don’t usually use pencil liners on my top lashes, but I decided to try this one because the tip is so short and it’s marketed to be super long-lasting. It went on really smoothly and has a crayon-like consistency. It blended in well and lasted all day, so I think I’ll be using this on the upper lashes as well as in the water line. Since it’s waterproof, it lasts much longer in the waterline than other liners. My only confusion with it is that it looks like a retractable liner, but it doesn’t move up or down when I twist it. I think this may be because it’s supposed to be a sample size, but I was pretty bummed. This lipstick is a beautiful natural mauve pink, and it smells like frosting. The applicator has a ton of product on it when you pull it out, so I used a lip brush to put this on. It stains the lips and lasts for a few hours, but by the end it definitely needs a lip balm on top. It doesn’t seem to layer very well, so once it fades it might be a good idea to exfoliate the lips completely before reapplying. This palette contains an assortment of greens: a champagne gold, golden olive, shimmery forest green, and satin deep green. Edgy (the deep green) is a bit difficult to build up, but I’m sure it works fine with a small brush for a more concentrated application, like as a liner. This palette is the browns. 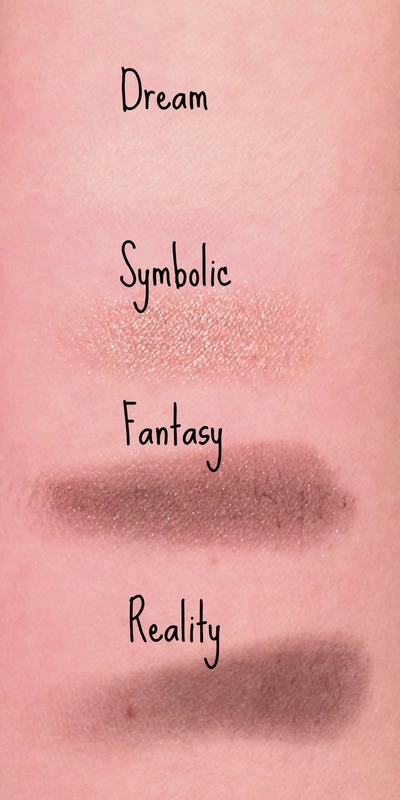 The lightest color looks beige in the pan but shows as a white shimmer; the other colors are true to pan: a shimmery copper, shimmery warm brown, and matte dark brown. This is probably the best matte of the bunch, although it’s still a bit chalky to swatch out. Again, I’m sure it does the job fine just as a liner, especially with a damp brush. 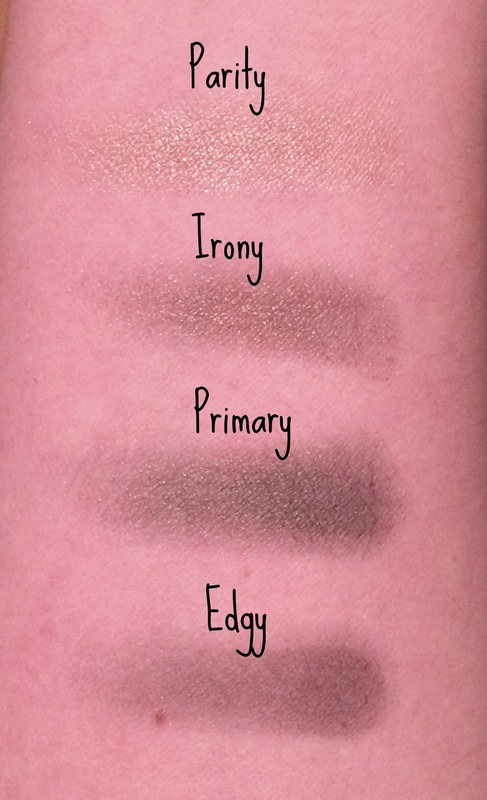 This palette has two taupes and two basics. Dream looks light pink in the pan but applies as a chalky matte ivory and isn’t easy to work with. Symbolic is the smoothest shade of all of these palettes, a beautiful shimmery warm taupe. Fantasy is a shimmery greyish taupe and shows up much darker than it looks in the pan. 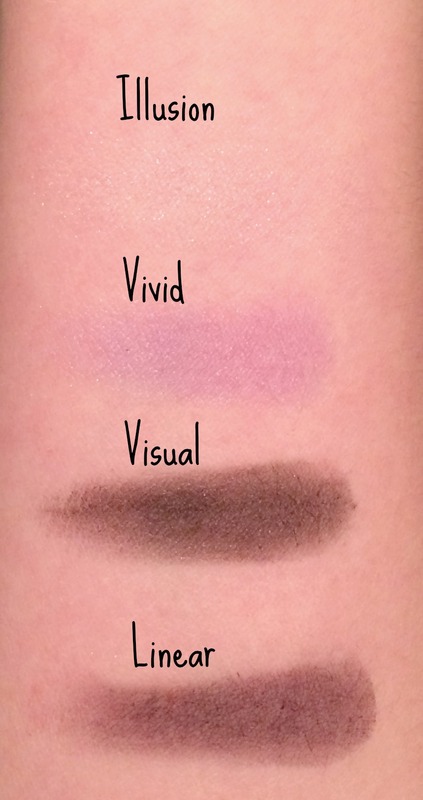 Reality is a matte black, and again, it’s not very smooth or buttery for a matte shadow. The last palette contains purples: a (VERY sheer) shimmery pale lavender, a satin lilac, a shimmery deep plum, and a matte dark purple. I’ll only use Illusion (the lightest shade) as an inner corner highlight since it’s so sheer. Visual is much deeper on the skin than it looks in the pan, almost black. Linear is a true purple, a little chalky but vivid, which is nice. Overall, I’m really happy about this set! It gives a really impressive array of products to try from the brand. My favorites are the the convertible color, eye liner, and Renaissance palette. Have you tried and Stila products? What’s your favorite brand to buy gift sets from?